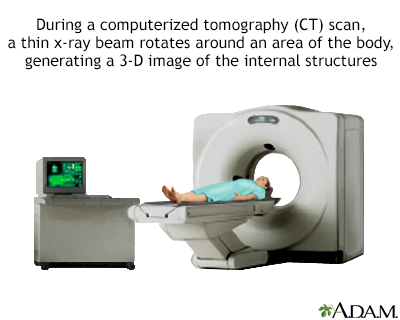 An abdominal CT scan is an imaging method. This test uses x-rays to create cross-sectional pictures of the belly area. CT stands for computed tomography. You will lie on a narrow table that slides into the center of the CT scanner. Most often, you will lie on your back with your arms raised above your head. A computer creates separate images of the belly area. These are called slices. These images can be stored, viewed on a monitor, or printed on film. Three-dimensional models of the belly area can be made by stacking the slices together. 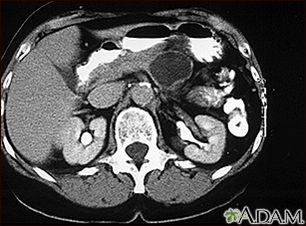 In many cases, an abdominal CT is done with a pelvis CT. The scan should take less than 30 minutes. You may have to drink the contrast before the exam. When you drink it will depend on the type of exam being done. Contrast has a chalky taste, although some are flavored so they taste a little better. The contrast you drink will pass out of your body through your stools and is harmless. Let your health care provider know if you have ever had a reaction to contrast. You may need to take medicines before the test to safely receive this substance. Before receiving the contrast, tell your provider if you take the diabetes medicine metformin. People taking this medicine may have to stop taking it for a while before the test. Let your provider know if you have any kidney problems. The IV contrast can worsen kidney function. Too much weight can damage the scanner. Find out if the CT machine has a weight limit if you weigh more than 300 pounds (135 kg). You will need to take off your jewelry and wear a hospital gown during the study. Lying on the hard table may be a little bit uncomfortable. These feelings are normal and go away within a few seconds. An abdominal CT scan makes detailed pictures of the structures inside your belly very quickly. A kidney stone is a solid mass made up of tiny crystals. One or more stones can be in the kidney or ureter at the same time. Pancreatic cancer is cancer that starts in the pancreas. 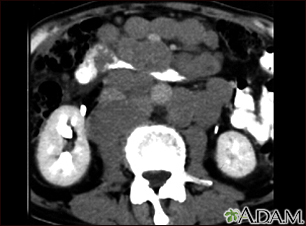 A pancreatic abscess is an area filled with pus within the pancreas. Hydronephrosis is swelling of one kidney due to a backup of urine. This problem may occur in one kidney. CT scans expose you to more radiation than regular x-rays. Many x-rays or CT scans over time may increase your risk for cancer. However, the risk from any one scan is small. Most modern scanners are able to reduce the radiation exposure. Talk to your provider about this risk and the benefit of the test for getting a correct diagnosis of your medical problem. The most common type of contrast given into a vein contains iodine. If you have an iodine allergy, you may have nausea or vomiting, sneezing, itching, or hives if you get this type of contrast. If you must be given such contrast, your provider may give you antihistamines (such as Benadryl) or steroids before the test. Your kidneys help remove IV dye from the body. You may need extra fluids after the test to help flush the iodine out of your body if you have kidney disease or diabetes. Rarely, the dye may cause a life-threatening allergic response. Tell the scanner operator right away if you have any trouble breathing during the test. Scanners come with an intercom and speakers, so the operator can hear you at all times. Shaw AS, Prokop M. Computed tomography. In: Adam A, Dixon AK, Gillard JH, Schaefer-Prokop CM, eds. Grainger & Allison's Diagnostic Radiology. 6th ed. New York, NY: Elsevier Churchill Livingstone; 2015:chap 4. Smith KA. Abdominal pain. In: Walls RM, Hockberger RS, Gausche-Hill M, eds. Rosen's Emergency Medicine: Concepts and Clinical Practice. 9th ed. Philadelphia, PA: Elsevier; 2018:chap 24. Wood CG, Berggruen S. Computed tomography of the solid abdominal organs. In: Gore RM, Levine MS, eds. Textbook of Gastrointestinal Radiology. 4th ed. Philadelphia, PA: Elsevier Saunders; 2015:chap 65. 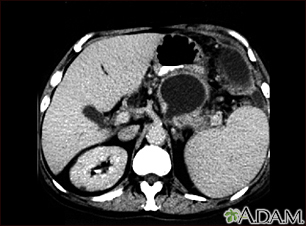 A CT scan of the upper abdomen showing cirrhosis of the liver. 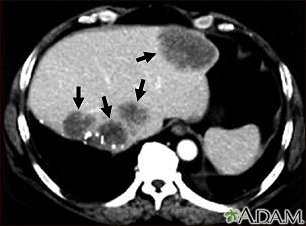 A CT scan of the upper abdomen showing multiple metastasis (cancer that has spread) in the liver of a patient with carcinoma of the large bowel. Note the dark areas in the liver (left side and center of picture). A CT scan of the middle abdomen showing a large tumor mass due to metastasis (spreading cancer) in abdominal lymph nodes. 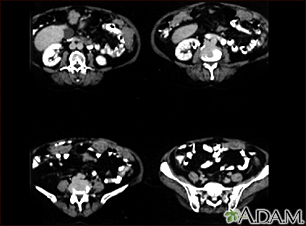 This abdominal CT scan shows tumor masses (malignant lymphomas) in the area behind the peritoneal cavity (retroperitoneal space). This CT scan of the upper abdomen shows a large tumor (neuroblastoma) on the person's right side (lower left side of picture). The tumor is behind the liver and is pushing the liver forward and may have possibly spread into the liver tissue. 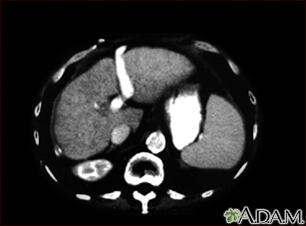 A CT scan of the upper abdomen showing a large cyst in the pancreas (cystic adenoma of the pancreas) seen on the upper right side of the picture. 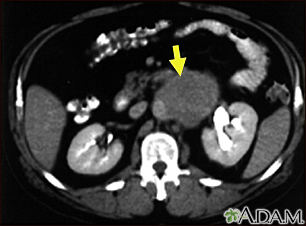 A CT scan of the upper abdomen showing a tumor (pancreas carcinoma) in the head of the pancreas, seen here in the middle of the picture. 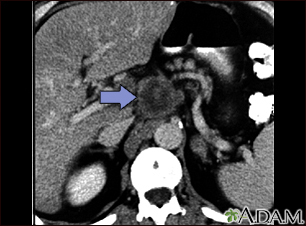 A CT scan of the upper abdomen showing a pseudocyst in the corpus, or tail, of the pancreas. 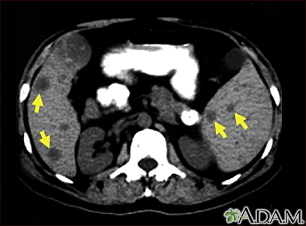 A CT scan series of the lower abdomen showing ovarian cancer that has metastasized (spread) to the peritoneum. 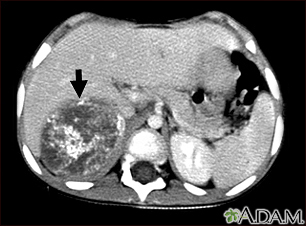 This CT scan of the upper abdomen shows multiple tumors in the liver and spleen that have spread (metastasized) from an original intestinal cancer (carcinoma). 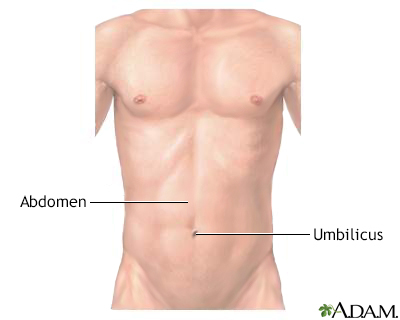 The abdomen is the area of the body between the chest and pelvis. 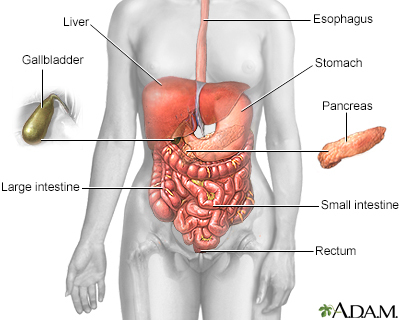 Some of the large internal organs comprised in this area are the liver, stomach, kidneys, and intestines.